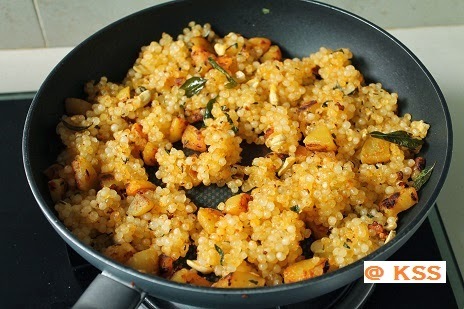 Sabudana khichdi is mainly made for breakfast and also eaten during fasting periods as it involves no onion and garlic. Basically, for this recipe only boiled potatoes are used. But we don't like eating bland potatoes so I've added little bit of spices to it. Making it spicy is purely optional. * Mix the turmeric powder, red chilli powder, salt on top of the potatoes and give a toss. Mix well. Set aside. 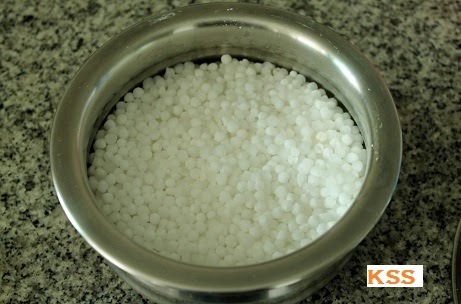 Wash the sago pearls 2 to 3 times and drain the water. Spread them in a wide container and add water just hardly to cover the sago. Close the container and let it soak overnight or the least soak for 4 to 5 hours. More the soaking time better it is handle and takes just a minute to cook. 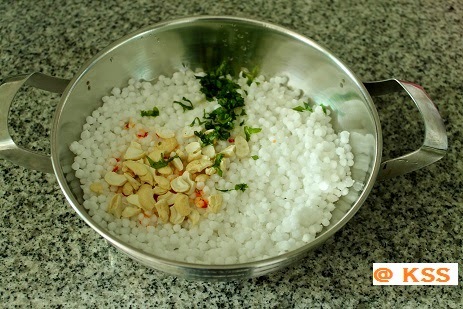 Add the soaked sago , roasted peanuts or cashew nuts, chopped coriander leaves, lemon juice ,salt and sugar to a wide bowl and mix everything together. 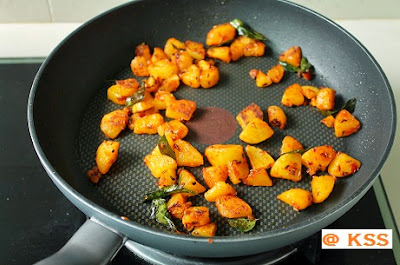 Heat a wide pan with ghee or oil and fry the cumin seeds. Followed by curry leaves, green chillies, fry them well. 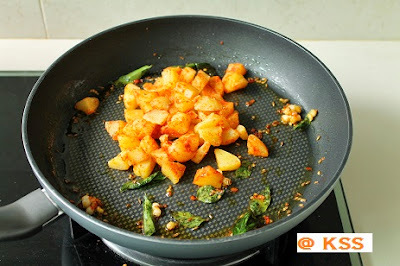 To that add the potatoes ( ur choice of either plain boiled or masala potatoes) fry them until it turns golden on the sides. Turn down the flame and add the prepared sago mixture to the pan, mix together very well. Do not stir much. Cover the pan and cook for 2 minutes top on a very low flame. 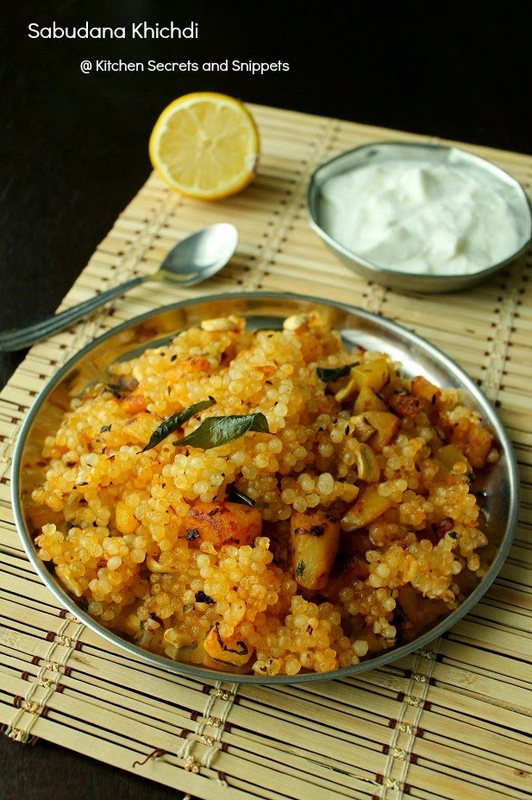 Mix again well and serve hot with raita. Here, I've slightly overcooked the sago for my taste. 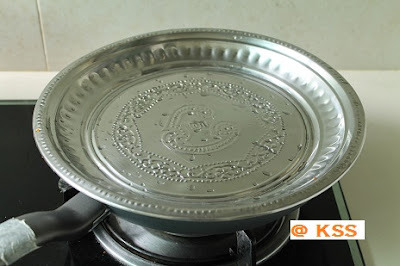 Cook for excatly 2 minutes on low flame if u need it to be perfect. Soaking time is very much needed. Soak for at the least 4 to 5 hours if u r running short of time. The cooking time will be more if it is not soaked properly. 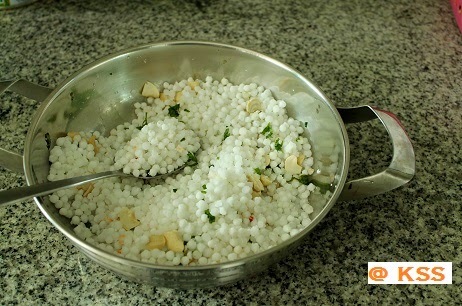 Always mix everything with the soaked sago before putting on the hot pan, that makes the cooking easy. 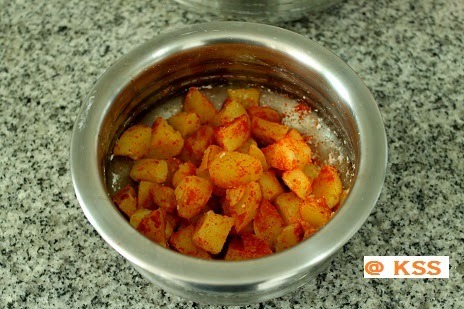 Making the potatoes spicy is optional, use plain boiled potatoes if u like it bland and that's how it is used in the original recipe. 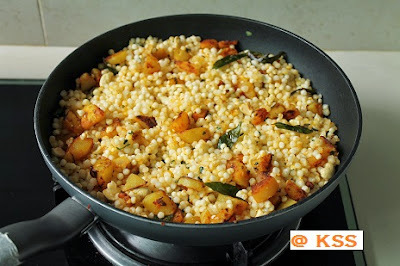 Add the soaked sago , roasted peanuts or cashew nuts, chopped coriander leaves, lemon juice ,salt and sugar to a wide bowl and mix everything together.Heat a wide pan with ghee or oil and fry the cumin seeds. Followed by curry leaves, green chillies, fry them well. To that add the potatoes ( ur choice of either plain boiled or masala potatoes) fry them until it turns golden on the sides.Turn down the flame and add the prepared sago mixture to the pan, mix together very well. 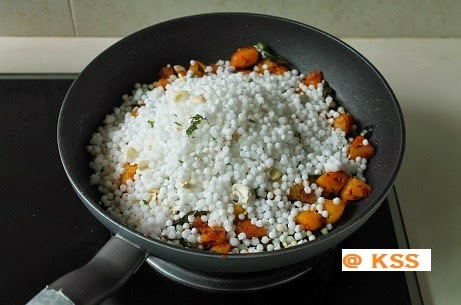 Do not stir much.Cover the pan and cook for 2 minutes top on a very low flame. Mix again well and serve hot with raita. Sabudana khichdi looks healthy and yummy. 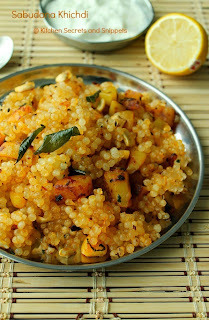 OMG...looks fantastic n mouthwatering....wonderful clicks!